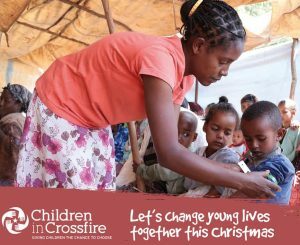 Everyone who features in our Ethical Gift Cards has been supported by Children in Crossfire, so we wanted to share with you just one of their stories of hope. Pictured is Tiblet, who is a Health Extension Worker in St Luke’s Hospital in Wolisso, Ethiopia. For the past five years Tiblet has worked in the very remote village of Meguako, tackling malnutrition there. Last year, Children in Crossfire built a well in Meguako. Before we did, villagers were forced to walk 7km to the nearest stream, which was also used by cows and monkeys. Not only was the water from here dangerous to drink, but many children were missing school because they were trekking to and from the stream each day to support their families. We simply cannot imagine a 14km round trip just to access dirty, diseased water but that was the reality of life.